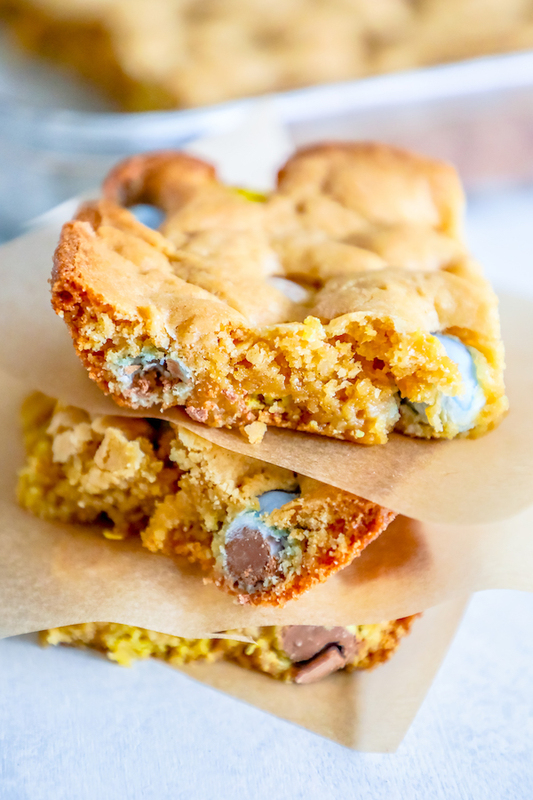 Simple, sweet, gooey and buttery Easy Cadbury Mini Egg Blondies are the most delicious easy blondie recipe ever – with Easter favorite Cadbury Mini Eggs baked inside! This is the best easy Easter dessert ever – just mix, bake, and enjoy! Your whole family will love this Easy Cadbury Mini Egg Blondies Recipe. Blondies are one of my favorite desserts – they are ooey, gooey, rich, buttery, and sweet – the perfect indulgence. They are so easy to make, fun to serve, and great for holidays because you can make them with all sorts of fun mix ins! I recently made my all-time favorite blondie recipe with one of my all-time favorite Easter treats to get in the mood for spring (Easter is SO early this year!) 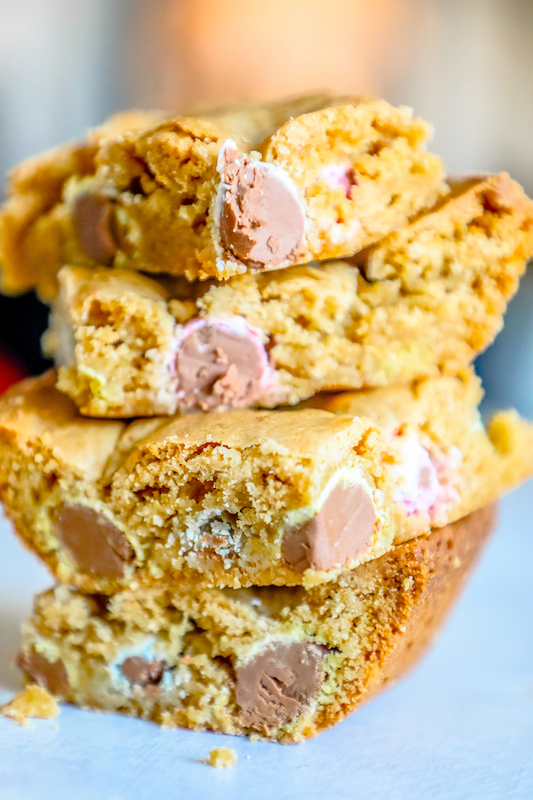 – and these Easy Cadbury Mini Eggs Blondies are my absolute new favorite dessert! This easy Easter dessert comes together in no time – and only uses one mixing bowl. No need to use different bowls for wet and dry – this dessert is unfussy and perfect for a party or Easter diner celebration! 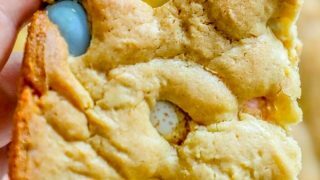 This Easy Easter Candy Blondie Recipe contains affiliate links. 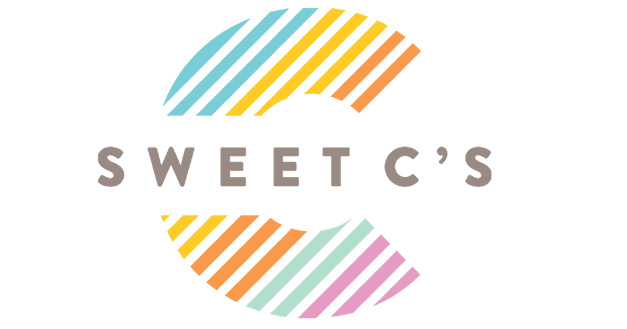 Purchasing through the links on my site helps me offset costs to run Sweet C’s Designs and provide totally free content to you at absolutely no extra cost! I only link to products I use and believe in, so you know it’s something you can trust. Cadbury Mini Eggs are definitely a cult classic in recent years – and can be tricky to get your hands on! 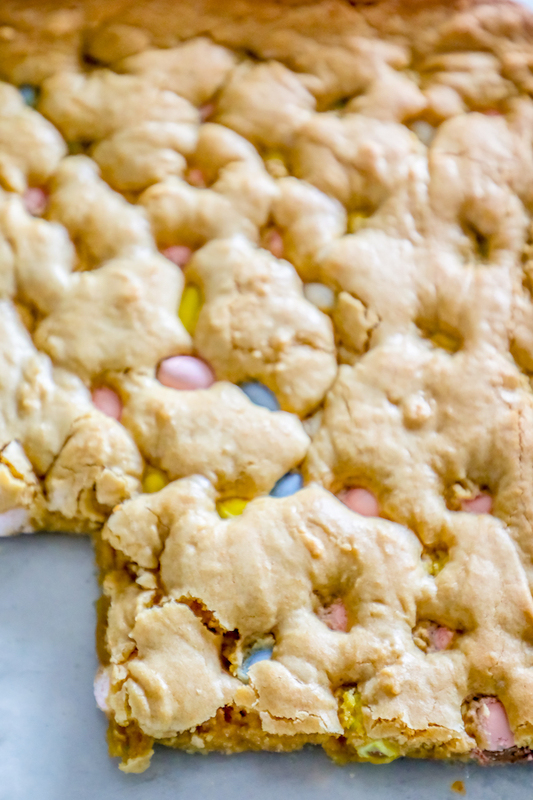 I’m listing other delicious Easter Candies that are great in these fun Easter Candy Blondies! Lets face it – recipes with Easter Candy are so bright, fun, and delicious – you can never get enough! I’ve included easy links to each type of candy – so you don’t have to worry about finding the Easter Candy you really want for this recipe! Simply click the links below. Mini Robins Eggs look almost identical to Cadbury Mini Eggs, and have similar flavors. If you can’t find Cadbury Mini Eggs, try for these for the most similar flavor. -Easter M&Ms – any variety. Easter colored M&Ms are so bright and fun – they are perfect for baking! Vary up flavors with peanut, classic, pretzel – whichever is your favorite! If you love Cadbury Mini Eggs, you might also love the rich malty flavors of Malt Balls – and they are perfect for adding to these blondies, too! 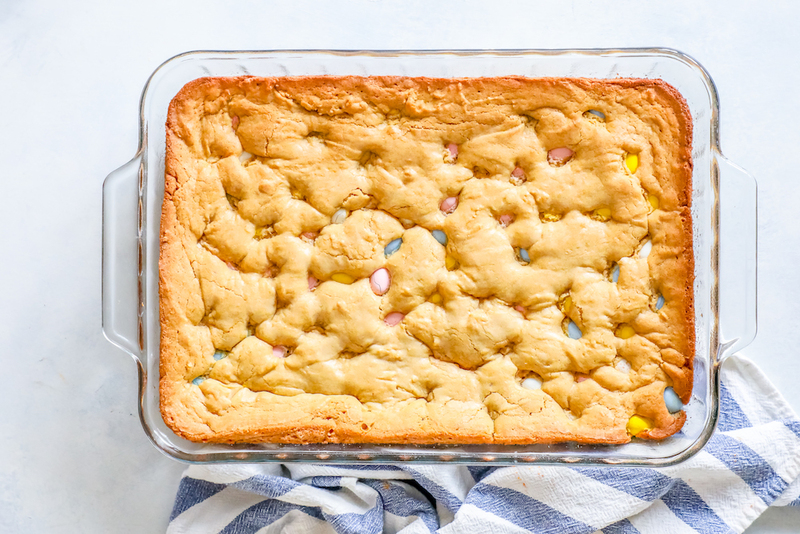 If you’ve never baked with jelly beans, this might sound funny – but jelly beans are totally fun and delicious in blondies for a unique Easter dessert! 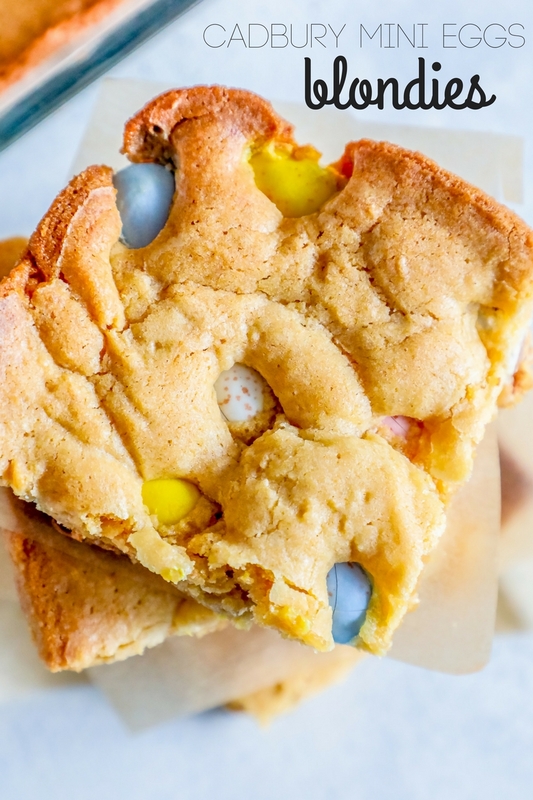 These Easter Blondies are incredibly easy, but there are a couple basic kitchen tools that will make the recipe go more smoothly. These products are tried and tested and I trust them to help you make magic in the kitchen! -Prepare your pan. Since blondies are gooey and rich like brownies, you need a well greased pan for these to come out cleanly. Make sure to prep your pan well with shortening, butter, or baking spray. -Blondies are always a little gooey. Don’t overbake, blondies should be a little gooey like a brownie and less firm than a cookie. -Melt your butter. Make sure your butter is melted – but not hot. -Store with parchment paper. If stacking, slide small squares of parchment paper under the blondies to keep them from all sticking together. -Mix candy in at the end. 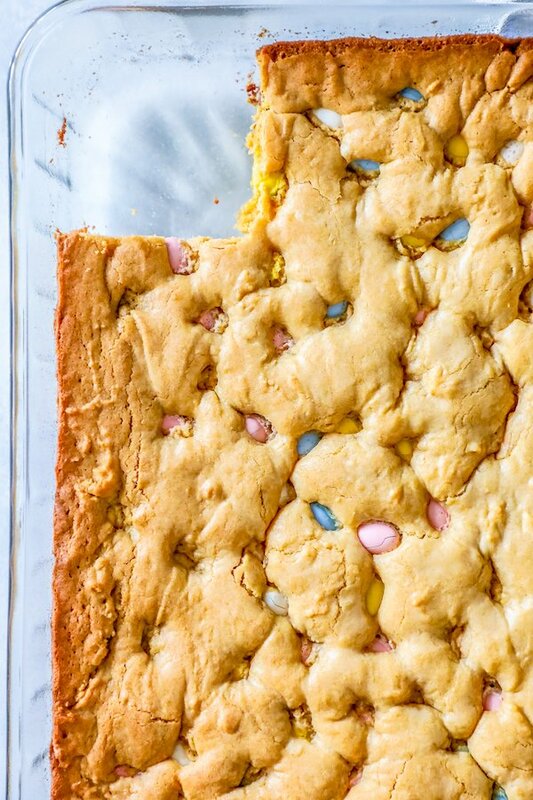 If you mix your Easter Candy in while still doing the bulk of your stirring or mixing, the colors will bleed all over the blondies – which might be desire-able, or just end up looking weird and gray. I prefer to add candy either right at the end (with a quick mix) or even after I’ve poured the blondie batter into the pan, so I can spread it out evenly and then simply push it into the dough for perfect placement with no color bleeding! If you love this easy and gooey blondie recipe, please check out some of my other favorite desserts! If you love this Easy Cadbury Mini Egg Blondies recipe as much as I do, please write a five star review, and be sure to help me share on facebook and pinterest! 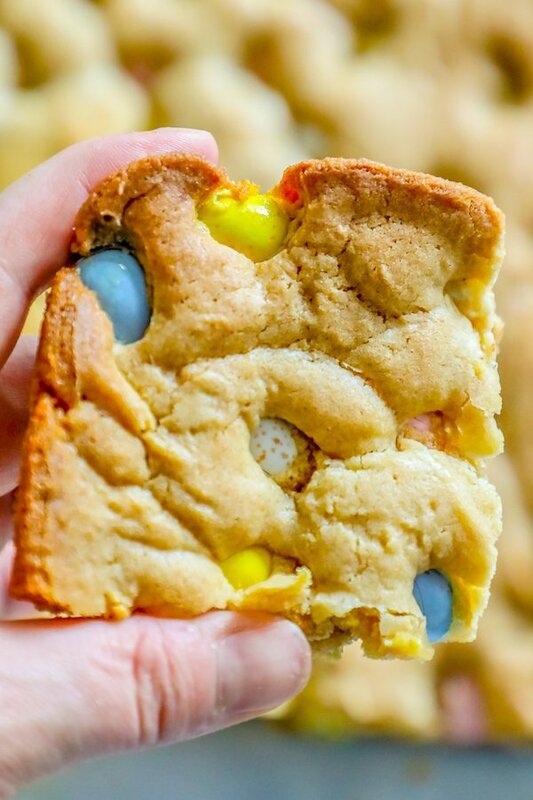 Simple, sweet, gooey and buttery Easy Cadbury Mini Egg Blondies are the most delicious easy blondie recipe ever - with Easter favorite Cadbury Mini Eggs baked inside! This is the best easy Easter dessert ever - just mix, bake, and enjoy! Grease a 9x13 casserole dish well. I prefer baking spray with flour. Mix butter and sugar in bowl. Stir in eggs and vanilla, mix well. Stir in cadbury mini eggs. Add to well greased casserole dish. Bake 25-30 minutes, until toothpick inserted in middle comes out clean. You had me at cadbury eggs! Paired with a blondie sounds like a combo I can’t resist! Cadbury eggs are the best thing ever and these blondies made with them are killing my diet because I can’t stop eating them! I am over her drooling!!! These are on my list of must makes!!! I’ll be making these with our leftover Easter candy!